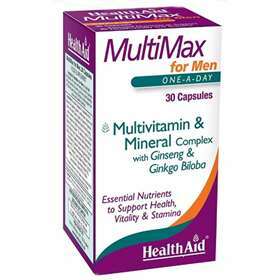 Health Aid MultiMax for Men One-a-Day 30 Capsules. Formulated specially to suit male well being by providing all the essential nutrients , plus the benefits of adding Ginseng and Ginkgo Biloba to help support an active and healthy lifestyle. Adults and children of 16 years of age, one capsule daily with food. Do not exceed recommended daily intake unless advised by a suitably qualified person. Emulsifier (rapeseed oil, rapeseed lecithin), Capsule Shell glycerol, purified water, natural colour (brown iron oxide), Bulking Agent (di-Calcium Phopshate, yellow beeswax), Standardised Korean (Panax) Ginseng Extract, Magnesium Sulfate, Ascorbic Acid, Inositol, Choline Bitartrate, Ferrous Sulfate**, DL-Methionine, Standardised Ginkgo Biloba Extract, Niacinamide, DMEA Bitartrate, Zinc Sulfate, dl-alpha Tocopheryl Acetate (vitamin E), D-Calcium Pantothenate, Potassium Iodide, Manganese Sulfate, Pyridoxine HCl, Thiamine Mononitrate, Potassium Citrate, Vitamin A Palmitate, Cupric Sulfate, Riboflavin, Sodium Selenite Folic Acid, Ergocalciferol (vitamin D2), Cyanocobalamin (vitamin B12), D-Biotin.